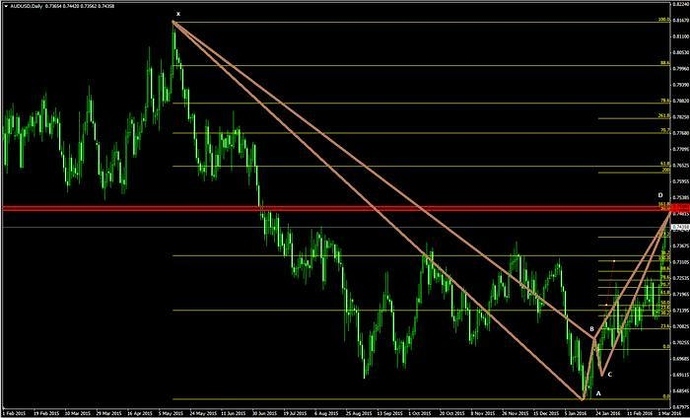 The is a perfect pattern on why 30 Pips a day keeps your money at bay. 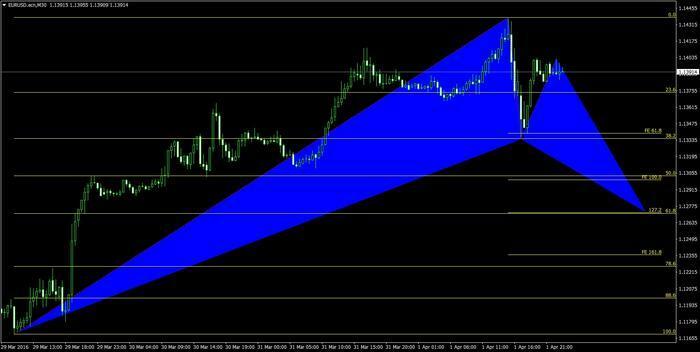 Bearish Gartley Pattern completing at 1.09062 the .618% Fibonacci level converging with the 2.618% ABCD extension. Target one for this pattern is 1.08777 Just above .382% Fibonacci level from the AD swing. Failure of this pattern is a closed 30 min candle above the .618% Fibonacci level from the XA swing. Sorry friend, that is not a Gartley pattern. Not even close. can you please reply why? hi HMoneyBags, please explain why you chose to take this trade. I can see that your pattern has had a reaction to the D point, but price had not been respecting the fib points before this, and i think tmb once said to make sure price is respecting the fib points before trading a D… so i am wondering if there is something big i am missing here in why you chose to take that trade at the D. please explain? Or you could Google it. They will all say the same thing. I have just installed KorHarmonics and am playing around with it. My interested was piqued when reading the school of pipsology harmonic pattern pages. Am i right in saying (after quite a bit of research)… that the skill, which comes from experience, is being able to identify point D, where the reversal happens? My main question is about take profits… the internet is filled with people who say to use different fibo retracement levels (some fro B-D, some from C-D…). How do you guys set your TP levels? OP - do you use 30 pips exactly every time? I am looking to trade a few different time frames, so 30 pips doesnt always seem right. With regards to Stop losses - does anyone have any rules for this? Thanks a lot guys, good luck. Hope you are doing good. It seems this is very informative forum for Harmonic wave. 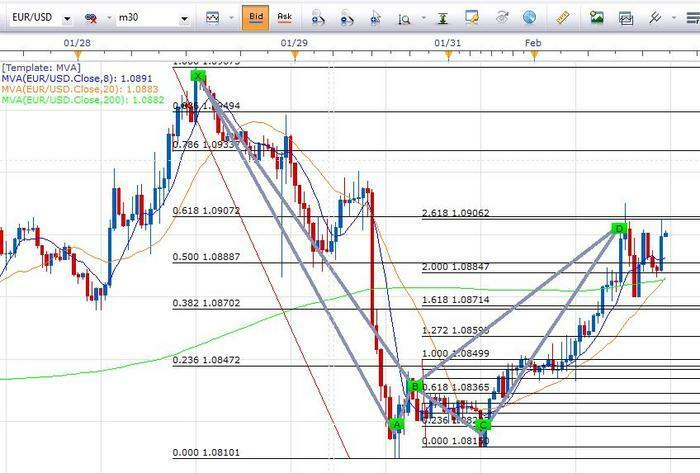 Do you still trade these patterns(30 pips a days!). If Yes, how your learning curve since 2009(Since this forum started). I’m sure there will be lot of learnings in this period. I am trading 3 years by now. But new to Harmonic wave. Just completed the baby pips Harmonic waves. Can you please share your insight on this like Which time frame to use, any specific pairs to trade this setups, any changes you made in terms of RiskReward. Also I have noticed in first few pages you have shared a youtube video for how to trade this pattern. Is there any other updated versions. Sorry for many questions. Actually I need to go through your forum completely to digest things. but there are 1058 pages. If you guide us through paticular pages or materials will definetly be a great help. Thanks a lot for such a wonderful and vrey insightful forum. Its Friday already , wait until Monday and then decided. I am totally new to Forex trading, but I have completed the school here and I am seeing the following pattern. I know today is Saturday and on Monday the price can start from a totally different point. Still I just want to know if I have drawn the pattern correctly. Once you learn a system that shows you results. Work on having full emotional control of your self and stay disciplined. Trust the analysis that you make of the markets before placing entry orders or entering market orders and never go against it. Accept every loss that is given and use proper risk management on every single trade. Never depend on anything outside of the system such as luck, wishful thinking or faith to determine the results of the trade. Sleep 8-10 hours a day, eat healthy, and keep your self physically fit. This is what I have learned in the past 8 years. For those of you that believe in faith… use it for your discipline and you will see results. You must be a lot younger or fitter than me. If I come back from the gym after a 2 1/2 hour workout, the only thing I’m ready for is bed! I keep getting surprised on how pro traders put alot of emphasis not only on their trading but also take their surroundings and other activities into account since it affects the trading in one way or another. I am sure the exercise helps alot but from what I see it is vital!